Lucian Leustean is Reader in Politics and International Relations at Aston University, Birmingham, United Kingdom, where he has taught since 2007. 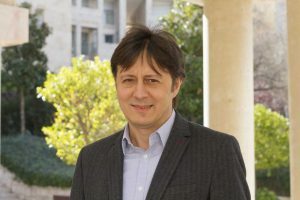 He studied international relations, law, and Orthodox theology in Bucharest, Romania, and completed his PhD in Political Science at the London School of Economics and Political Science. His publications include, as author: The Ecumenical Movement and the Making of the European Community (Oxford University Press, 2014) and Orthodoxy and the Cold War. Religion and Political Power in Romania, 1947-65 (Palgrave, 2008) (Winner of the George Blazyca Prize in East European Studies from the British Association for Slavonic and East European Studies); and as editor: Representing Religion in the European Union: Does God Matter? (Routledge, 2014), Eastern Christianity and Politics in the Twenty-First Century (Routledge, 2014), Eastern Christianity and the Cold War, 1945-91 (Routledge, 2010), and Orthodox Christianity and Nationalism in Nineteenth-Century Southeastern Europe (Fordham University Press, 2014).